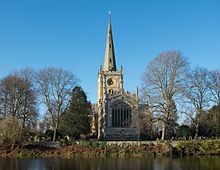 The settlement which later became known as Stratford was first inhabited by Anglo-Saxons following their 7th-century invasion of what would become known as Warwickshire. The land was owned by the church of Worcester and it remained a village until the late 12th century when it was developed into a town by lord of the manor, John of Coutances. John laid out a new town plan in 1196 based on a grid system to expand Stratford and allow people to rent property in order to trade within the town. Additionally, a charter was granted to Stratford by King Richard I in 1196 which allowed a weekly market to be held in the town, giving it its status as a market town. These two charters, which formed the foundations of Stratford's transformation from a village to a town, make the town of Stratford over 800 years old. Many of the town's earliest and most important buildings are located along what is known as Stratford's Historic Spine, which was once the main route from the town centre to the parish church. 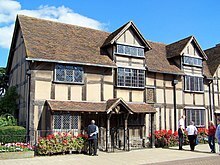 The route of the Historic Spine begins at Shakespeare's Birthplace in Henley Street. It continues through Henley Street to the top end of Bridge Street and into High Street where many Elizabethan buildings are located, including Harvard House. The route carries on through Chapel Street where Nash's House and New Place are sited. The Historic Spine continues along Church Street where Guild buildings are located dating back to the 15th century, as well as 18th- and 19th-century properties. The route then finishes in Old Town, which includes Hall's Croft and the Holy Trinity Church. 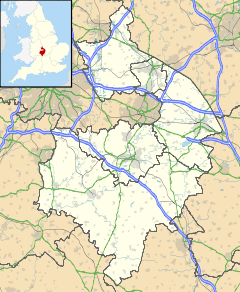 Stratford is 22 miles (35 km) south-east of Birmingham. It is close to the Cotswolds, with Chipping Campden 10 miles (16 km) to the south. Suburbs and areas of the town include Shottery, Bishopton, Bridge Town, Tiddington, and Old Town. The Attic Theatre is Stratford-upon-Avon's premiere fringe theatre. Established by husband-and-wife team John and Catherine Partridge in 2009, who also run the award-winning Tread The Boards Theatre Company. The venue is located next door to Cox's Yard and hosts an intimate 90-seat auditorium in the Grade 2 listed Attic space. The town is also the setting of the BBC detective show Shakespeare & Hathaway: Private Investigators. Every year, Shakespeare's birthday is celebrated in Stratford. The celebration takes place over two days on the weekend closest to the 26th of April, the date of his christening, and includes musical performances, drama and a parade through the town. In 2016, events were held in Stratford to mark the 400th anniversary of Shakespeare's death. 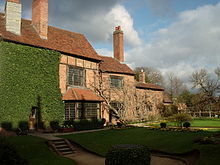 Behind The Shrieves House is a museum called "Tudor World" with recreations of 16th-century life in theatrical settings. The Bancroft Gardens and river area is a very popular place for people watching, enjoying picnics and river activities. In the summer the River Avon is busy with rowing boats, motor boats and river cruises. The Birmingham to Stratford Canal is busy with colourful narrowboats passing through or mooring up in the canal basin Stratford-upon-Avon Canal. There are often jugglers, fire-eaters and magicians entertaining the public on the lawns. On the edge of the gardens is a water fountain, known as the Swan Fountain. It was unveiled in 1996 by the Queen Elizabeth II to recognise that Stratford has been a market town since 1196. It is from here the Stratford Town Walk meet every day (even Christmas Day), to offer a guided walking tour of the town. 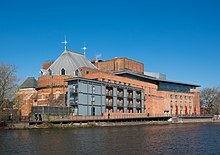 The tour passes the Shakespeare houses, Royal Shakespeare Theatres, 15th-century timber-framed buildings, William Shakespeare's school and visits Holy Trinity Church where Shakespeare was baptised and is buried. Several companies offer sightseeing cruises along the Avon and the canal, some using old river barges that have been converted to this use. Stratford-upon-Avon Rugby Club is situated on Loxley Rd at their home ground Pearcecroft. The club fields three senior sides and a colts under 18 team with the 1st XV currently playing in Midlands 1 (West). The club also has a large mini and junior section.Stratford-upon-Avon Cricket Club Ground is by the river opposite the Royal Shakespeare Theatre. The first match recorded there was in 1880; it has hosted first-class games since 1951 and women's One Day Internationals since 2005. Stratford Town F.C. are based at the DCS Stadium in Tiddington; they won the Midland Alliance in the 2012/3 season and were promoted to Division One South & West of the Southern Football League. The town's parkrun event started in February 2016 and operates on the Recreation Ground every Saturday at 9 am. ^ "History of The Bear Pit". Bear Pit Theatre. Retrieved 25 March 2019. ^ a b "Our history". The Attic Theatre. Retrieved 25 March 2019. 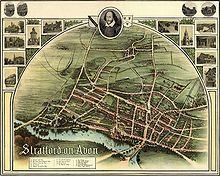 ^ "The borough of Stratford-upon-Avon: Introduction and architectural description". British History Online. Retrieved 28 February 2019.